It’s a cliché – the eyes are the windows to the soul – but it’s true. Our eyes are a focal point of our beauty: they communicate, even if we say nothing. What are your eyes saying about you? That you are bright and vibrant? Or that you’re tired and stressed? Dark circles and puffiness can impact your appearance, and your confidence. What can you do about it? You can blame everything from heredity and age to fatigue and stress for dark circles. The skin under your eyes is very thin, and it lacks the fat and tissue support that other areas of the body have. Thus, it is easier to see blood vessels. When you’re experiencing stress or exhaustion, it disrupts optimal circulation, and the results are written all over your face. How can you combat dark circles under your eyes? Get more sleep? Eliminate stress? Sure! That helps – but is it realistic in today’s fast-paced, high-test world? Fortunately, there is a realistic solution that fits with your busy life: CHOLLEY. If you’re struggling with dark circles, try BIOREGENE Crème Anti-Cèrnes against Puffiness and Dark Circles for the Eye Contour Area. This revolutionary decongestant cream works to relieve the buildup of fluid under your eyes as you experience fatigue, lack of sleep, stress, etc. At the same time, it hydrates and strengthens your skin so those blood vessels do not as readily show through. Diminish those dark circles, reduce puffiness, and reinvigorate your skin and revive its natural, healthy glow. 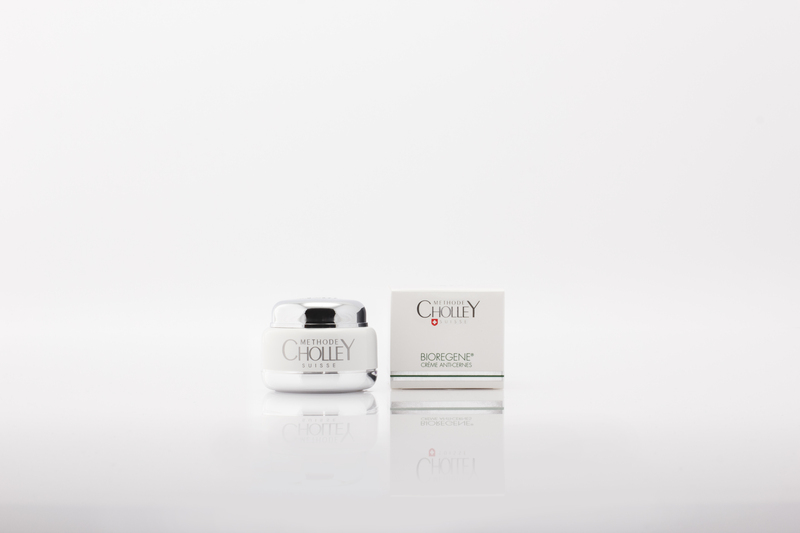 CHOLLEY also offers a line of eye contouring products that will help you care for the sensitive skin around your eyes. You may be tired or stressed, but you needn’t look it! When your eyes and the surrounding skin are healthy and beautiful, it reflects on your entire appearance.